The Foundation for Landscape Studies is pleased to announce the awardees of the 2019 John Brinckerhoff Jackson Book Prize for recently published books that have made significant contributions to the study and understanding of garden history and landscape studies. The recipients are listed in alphabetical order. This beautifully illustrated volume features more than 150 historic photographs, stereographs, postcards, engravings, maps, and contemporary images that illuminate the origins of rural cemeteries, their physical evolution, and the nature of the landscapes they inspired. Extended profiles of twenty-four rural cemeteries reveal the evolving design features of this distinctive landscape genre before and after the American Civil War, facilitating their identification and preservation. In addition, Grave Landscapes places rural cemeteries in the broader context of American landscape design, thereby illuminating their influence on the creation of public parks. The late James R. Cothran was a landscape architect, urban planner, and garden historian in Atlanta, Georgia, where he served as an adjunct professor of garden history and preservation at the University of Georgia and Georgia State University. A fellow of the American Society of Landscape Architects, Cothran is the author of Gardens of Historic Charleston, Charleston Gardens and the Landscape Legacy of Loutrel Briggs, and the award-winning Gardens and Historic Plants of the Antebellum South. Erica Danylchak holds degrees in history from Boston University and heritage preservation from Georgia State University. She has worked in archival science at the Cherokee Garden Library and the Kenan Research Center at the Atlanta History Center, and in preservation as executive director of the Buckhead Heritage Society. Danylchak served as a research fellow for the Georgia Historic Landscape Initiative and in 2009 received the Jenny D. Thurston Memorial Award from the Atlanta Urban Design Commission. Today cities around the globe are planting street trees to mitigate the effects of climate change. However, as landscape historian Sonja Dümpelmann explains, this is not a new phenomenon. 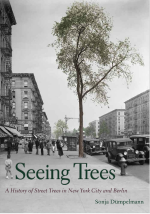 Focusing on two cities in the nineteenth century – New York City and Berlin – she discusses the planting of trees to improve the urban climate and how this practice affected the larger social, cultural, and political aspects of urban life. Sonja Dümpelmann is a landscape historian and associate professor of landscape architecture at the Harvard University Graduate School of Design. She is the author of Flights of Imagination: Aviation, Landscape, Design (2014) and a book on the pioneering twentieth-century Italian landscape architect Maria Teresa Parpagliolo Shephard (2004). In addition, she served as editor of A Cultural History of Gardens in the Age of Empire (2013) and coeditor with Dorothee Brantz of Greening the City: Urban Landscapes in the Twentieth Century (2011). 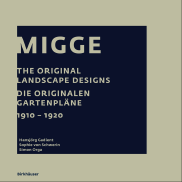 “Gardens for everyman!” was the central credo of Leberecht Migge (1881–1935), one of the most influential landscape architects of the twentieth century. His estate was thought to be lost until the discovery of more than three hundred original plans and drawings in the Archives of Swiss Landscape Architecture. This book presents numerous projects, many previously unknown, ranging from large-scale plans for housing settlements to detailed designs for luxurious private gardens. Introductions to the historical period and to Migge’s ideas put the plans in context. Indices of persons, places, and plant names complement the text and illustrations. Two plans, reprinted at original size, accompany this volume. Hansjörg Gadient is an architect, landscape architect, and professor at Rapperswil University of Applied Sciences (HSR), where he teaches the design and planning of urban open space in the bachelor’s and master’s study programs. Sophie von Schwerin is a gardener, landscape architect, and historian of garden art who joined the Institute for Landscape and Open Space at the HSR in 2012 and has served as curator at the Archives of Swiss Landscape Architecture since 2015. Simon Orga is an architect who joined the staff at the Institute for Landscape and Open Space at the HSR in 2012 and has been a member of the team of the Archives of Swiss Landscape Architecture since 2015. American Eden tells the forgotten story of David Hosack, a young New Yorker who set out to put his raw, commercial city on the scientific and cultural map of the United States. In 1801, on twenty acres of Manhattan farmland, Hosack founded the first public botanical garden in the new nation, amassing a spectacular collection of medicinal, agricultural, and ornamental plants. Victoria Johnson is a former Cullman Fellow at the New York Public Library and an associate professor of urban policy and planning at Hunter College in New York City. She teaches on the history of philanthropy, nonprofits, and New York City. She holds a doctorate in sociology from Columbia University and an undergraduate degree in philosophy from Yale. In this book the author explores a pivotal moment in the preeminent modernist landscape architect’s career: the years in which he was an appointed member of the Federal Cultural Council in Brazil. While serving on this advisory panel created by the country’s military dictatorship in the mid-1960s, Burle Marx authored eighteen environmental position pieces. Together with her translation Seavitt Nordenson presents pertinent examples of Burle Marx’s public projects in Brazil – several of which were commissioned by the military regime. Depositions offers new insight into Burle Marx’s outstanding landscape oeuvre and elucidates his transition from prolific designer to prescient political counselor. Catherine Seavitt Nordenson is an associate professor of landscape architecture at CUNY’s City College of New York and principal of Catherine Seavitt Studio. Her research focuses on design adaptation to sea-level rise in urban coastal environments and explores landscape-restoration practices within the dynamics of climate change. Between 1914 and 1950, Ellen Shipman (1869–1950) designed more than six hundred gardens, from Long Island’s Gold Coast to the state of Washington. Her secluded, lush, formal gardens attracted a clientele that included the Fords, Edisons, Astors, and du Ponts. Shipman’s imaginative approach merged elements of the Colonial Revival and Arts and Crafts movements with a unique planting style enlivened by impressionistic washes of color. 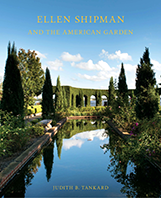 Richly illustrated with plans and photographs, the book explores Shipman’s ability to create intimate spaces through dense plantings, evocative water features, and ornament. This updated edition of a book first published in 1996 includes many newly discovered gardens as well as color photographs of surviving gardens, such as those at the Cummer Museum of Art and Gardens and Tranquillity Farm. Judith B. Tankard is a landscape historian, author, and preservation consultant. She received an M.A. in art history from the Institute of Fine Arts, New York University, and taught at the Landscape Institute of Harvard University for over twenty years.